Escape to a BEAUTIFUL Secl, Streamfront w/ HOT TUB-Relax here this winter! Looking for quiet seclusion? -You just found it! Escape to the Poconos. "Robins Nest" features an open floor plan, a pellet stove (warm & cozy) and a 7 person hot tub. upstairs is the loft (den) with a daybed with trundle that sleeps 2 & a futon bed/couch & a tv. The downstairs main area features an open floor plan, a pellet stove. Dining Room table seats 8 and is counter height! full size futon mattress on the bottom (sleeps 3). All rooms have TVs. Community Amenities: Indoor/Outdoor (seasonal) pools. Tennis Courts, basketball courts, Playgrounds, Fitness Room, Private Lake with Sandy Beach, Pavilion with picnic tables, playground, bathroom facilities, fishing dock. Area Attractions: Nearby Pocono attractions include Shawnee Ski Mountain, Shawnee Water Park, Camelback Ski Mountain, Camelbeach Water Park, Bushkill Falls, Resica Falls, Fernwood Resorts, Caesar's Pocono Palace, Pocono Bazaar Flea Market, antiquing, museums, Mountain Laurel Performing Arts Center, PEEC (Pocono Environmental Education Center), Winona Falls, Delaware Water Gap National Recreation Area, cross country skiing, ATV trails, miniature golf, wildlife viewing, tubing,restaurants, cinemas, sightseeing, rafting, climbing, swimming,boating, sailing, shopping, paint ball, go-carting, zoo, white-water rafting (Delaware River), canoing, kayaking, fishing, golfing (Tamiment),Fernwood, and Great Bear), horseback riding (Fernwood Resort), snowmobiling, snow tubing (Fernwood Resort), hiking,biking, and so much more! service but please be sure to contact us for the necessary password. I have been the owner and creator of Bushkill Waterfront Rentals since 2007. It has been my greatest passion and I think that is why people continue to come back to stay! We decided to buy the house next door when it became available since we have fallen in love with Tom's creek, which runs right in the backyard! Master Bedroom has it's own private full bathroom. Filtered water/ice on the door. Fully stocked and ready for your groceries! Right out on the BACK DECK-with a spectacular view! *PLEASE NOTE The game room as well as other amenities are not on location but 1/2 mile down the road. This house DOES have it's own hot tub. The pictures and reviews do not do this home and property justice! It is like a magical forest hideout! We were a group of 4 but there was pleanty of room for more! We enjoyed the hot tub..even in the rain and snow! When it snowed we were plowed out both times right away and there was an alternate place to park during bad weather.. Cooked on the grill and many meals in the kitchen. Kitchen is stocked with all pans and utensils needed. I’ll admit I was intimidated by the wood pellet fireplace but it was easy to use and Valarie gave great instructions.. We were thrilled with the two fire pits - wood and gas! The stream is loud and soothing, in the morning we sat outside with coffee and at night with beers :) So much fun, we stayed 9 days but wanted more :( we will be back! Galactic Snow tubing at Camelback and antiquing galore! We were there for a long weekend around New Year's. Three families with kids. It was a perfect size and close to Shawnee where we skied. Love it! A little far from camelback but loved amenities. Especially hot tub . Our family highly enjoyed our stay. 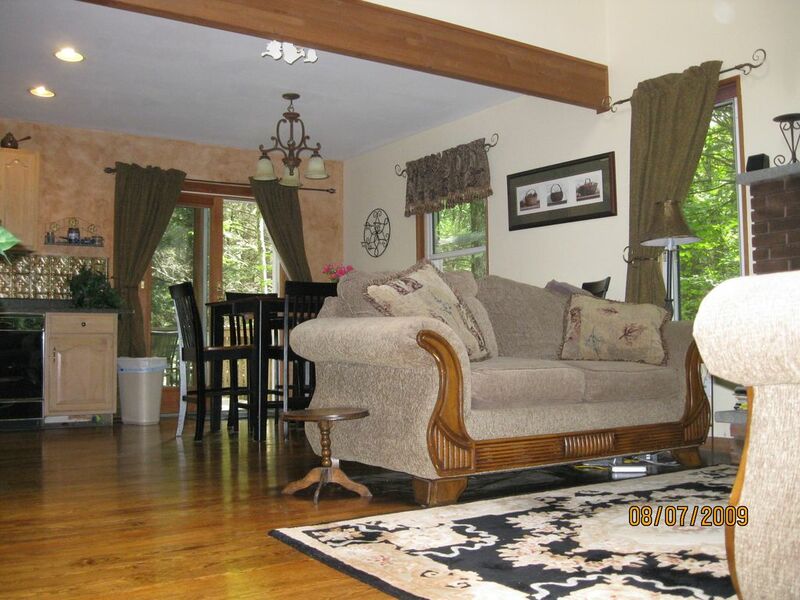 Highlights included the back deck, beautiful scenery, nice master bedroom and loft. We especially enjoyed the hot tub. Home is well maintained and cared, clean, and comfortable. Our daughters loved the bunk beds. The washer and dryer also came in handy to dry towels, rinse swim suits, etc. Only complaints would be that the grill and table were out of propane and none of the closest places sold the same propane tanks. If your pup comes with you and needs a long leash walk, it is better to drive to a different location than to try to take a long walk from the home. Overall we enjoyed our stay and had a very nice getaway! Very clean and cozy place. Very good view from the back yard deck. Master bedroom was a gem. Will recommend the place to anyone looking for quality family time and tranquility. your pic - on the deck at the house, at the clubhouse or up at the lake! Ski: We offer FREE Skiing at our local ski mountain and free horseback riding! There is also snowtubing at Fernwood (10 minutes) or Skiing at Shawnee Mountain (20 minutes) and Camelback (45 minutes).